Street Fighter II - The World Warrior © 1991 Capcom. Street Fighter II - The World Warrior is the legendary fighting game that defined the fighting game genre. One or two players can choose from eight selectable World Warriors and must defeat the other seven, before finally taking on four non-selectable 'boss' characters. Each fighter is as distinctive in feel and fighting style as they are in physical appearance, with each protagonist possessing several fantastical 'special moves' (the first genuine example of such in the fighting genre) to accompany the usual array of kicks, punches and throws. These special moves, while being difficult to execute due to the complexity of the joystick and buttons combinations required, allows the fighter to inflict huge amounts of damage on their opponent. Street Fighter II is a fighting game in the truest sense of the word, with deceptively deep and strategic gameplay ensuring that experienced players would destroy simple 'button mashers' with relative ease. Street Fighter II was released in February 1991 in the Japanese arcades. It was known as the 14th video game made for the CP System. "Street Fighter II - The World Warrior [B-Board 90629B-2]"
"Street Fighter II - The World Warrior [B-Board 90629B-3]"
SFII was the fighting game that changed the face of video-games forever. So innovative was the game, that many of the game-play elements that fighting fans now take for granted, appeared HERE first. Within just weeks of release, its place in gaming history was assured. Any fighting game that has appeared after SFII is influenced - to a greater or lesser degree - by the Capcom legend. During the development of SFII (and before the release of Final Fight), the very first free-hand drawing was done in the fall of 1988. At this time, eight prototype characters and an Island design was drawn. Just like the world map of the final version, the island would scroll on-screen to show the next destination, culminating at the top of the island. * With the rapid success of SFII, it was rumored that Mattel, the makers of Barbie, sued Capcom for using the name Ken - insisting that people would confuse the Street Fighter character with that of Barbie's boyfriend. To avoid further litigation Capcom gave Ken a surname. * Fans of Street Fighter are well accustomed to the story of 'Sheng Long'. SFII was already very popular in the arcades when the April issue of Electronic Gaming Monthly (EGM) came out. The story relates to a supposed secret character in SFII; his name was Sheng Long, the 'master' of Ryu and Ken. To reach him, according to EGM, the player had to survive a number of matches against M. Bison WITHOUT actually touching him. Should you achieve this, Sheng Long would apparently appear and kill Bison, and the player would then fight him instead. His style was essentially a mix of Ryu's and Ken's styles, but was much faster and inflicted far greater damage. When the EGM issue came out, thousands of gamers spent hours pouring money into SFII machines, trying to get to this non-existent character. Capcom had neither confirmed nor denied the Sheng Long story - obviously spotting the increase in revenue the mythical character could generate - and it was only much later that EGM themselves admitted that it was just an April Fools' joke. * There were only ever THREE official Capcom versions of SFII, at least until the switch to the CPS2 system was made. The first was "Street Fighter II - The World Warrior"; more commonly referred to as 'Street Fighter II'. The second was "Street Fighter II' - Champion Edition" (also known in Japan as "Street Fighter II Dash" because the Japanese refer to the apostrophe after the 'II' as a 'dash') and many operators from that era will probably relate to the problems that its release caused. Capcom originally made 'Champion Edition' available only in dedicated form - insisting that only a limited number of these dedicated units would be manufactured - and the game would never be produced in kit form. 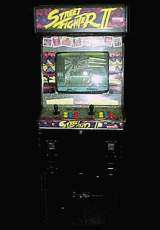 After everyone who could afford the machines had invested in the expensive dedicated units, Capcom, somewhat inevitably, began producing the game in kit form, claiming that they never knew how much demand there would be for the game. After the earnings from 'Champion Edition' began to subside, the infamous 'grey market' enhancements began to appear. Many of these went by names like 'Turbo', 'Hyper', and 'Super', including the 'Rainbow Edition' and 'Accelerator T1'. In early 1993, Capcom sued these manufacturers for copyright infringement and thus put an end to the development and distribution of these unauthorized enhancement kits. 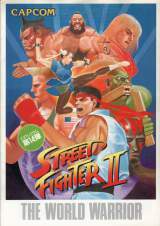 Capcom then released "Street Fighter II' - Hyper Fighting" (known as "Street Fighter II' Turbo - Hyper Fighting" in Japan), as the 'official' "Champion Edition" upgrade. This, just like the grey market kits, was a simple ROM upgrade to the "Champion Edition" board. Later on, Capcom developed the CPS2 (A/B) system that featured "Super Street Fighter II - The New Challengers" and its sequel "Super Street Fighter II Turbo" (known as "Super Street Fighter II X - Grand Master Challenge" in Japan), the final 'Street Fighter II' game until the 2003 release of "Hyper Street Fighter II - The Anniversary Edition". The Ken music theme was certainly inspired by Cheap Trick's song; Mighty Wings (1986). 1) Ryu stage : The stage has red-orange sky and a yellow moon. 2) E. Honda stage : The walls are dark blue; the floor is royal blue. The big picture (excluding the sun) is black. The 'Victory' sign is blue. The Hiragana Yu on the left is purple. 3) Blanka stage : The snake is green, and the wooden houses are in brighter colors than in "Street Fighter II' - Champion Edition". 4) Guile stage : The sky is daylight. There is teal tinted canopy on the jet. The symbol on the ground is blue. The missile linings are yellow. The people in the background wear green, but that doesn't change until "Super Street Fighter II - The New Challengers". 5) Ken stage : The boat is red; the 2 guys on top are wearing brown clothes and purple clothes. On the bottom are the bald man in grey shirt, a man in white bowler and white coat, a woman in pink dress, and a guy in the cyan shirt and brown pants. The guy in the trenchcoat and hat is blue. 6) Chun Li stage : The 2 customers wear blue, the meat store's roof is light blue and its sign is red, the meats hanging on the ceiling are pink, the man holding the chicken wears green, the "Shanghai Friend Corridor" is light blue with red letters, the water sign is green, and the ground is a bright beige. 7) Zangief stage : The floor is silver, and the area to the left is red. The 'Attention' flyers are tan with brown letters. 8) Dhalsim stage : The stage has red curtains, a teal stone floor, and a red carpet. 9) Balrog ([JP] M. Bison) stage : The stage floor is blue. The guy throwing confetti at win/lose wears orange, the car to the left is navy blue, and the car to the right is black. 10) Vega ([JP] Balrog) stage : The stage and floor are orange, and the Flamenco dancers are dressed in yellow. 11) Sagat stage : The Buddhist statue is silver, and the grass is a lighter shade of green than in later versions of the game. 12) M. Bison ([JP] Vega) stage : the sky is daylight. The palace roof is pale red, and the bell is olive-green with red trim. The E in E. Honda's name stands for his first name, Edmund; the M in M. Bison's name stands for 'Major'. * About Chun Li : Chun Li is notable for being one of the first successful and popular female video game protagonists. When SFII was released, most female characters in games existed as objectives to be rescued or cast in the roles of other supporting characters, such as townspeople, girlfriends, the occasional opponent, or simply background decoration. Beyond RPGs, there were very few female heroes in action-based video games. After the success of SFII and Chun Li's popularity, female protagonists became more and more common. Since then, in games with selectable characters, at least, there will generally always be one or two selectable female characters. * About M. Bison ('Vega' in Japan) : His design shares more than one detail with Kato, a character of the anime 'Doomed Megalopolis'. Like Kato, M. Bison is tall and thin, wears a red military uniform, keep wind his body with a black mantle when he's not fighting and possesses some obscure evil powers: even the star impressed on his hat (until Super Street Fighter II) is similar to the design of Kato. The cabinet and the main characters Ryu, Ken, Zangief Chun Li, Cammy, Blanka and M. Bison, make an appearance on the 2012 animation movie 'Wreck-It Ralph' from Walt Disney Animation Studios. * WORLD, US and JAPAN releases. * WORLD and US releases. * US and JAPAN releases. US versions have the "Winners Don't Use Drugs" screen. * Balrog is named 'M. Bison' (in this case, the M stands for 'Mike', see Trivia section above for further details). * Vega is named 'Balrog'. * M. Bison is named 'Vega'. * Guile's deceased friend Charlie is named 'Nash'. * Guile's wife Jane is named 'Julia'. * Guile's daughter Amy is named 'Chris', however there is no mention of her name anywhere in Guile's Japanese ending. * Blanka's ending : In the non-Japanese versions, Blanka's mother says that he was lost when his plane crashed in Brazil when he was a baby. In the Japanese versions there is no explanation of how, when, or where mother and son were separated. Since the anklets she gave to Jimmy BEFORE they were separated still fit him, he was probably not supposed to be a baby when he was lost. * Chun Li's ending : Chun Li refers to M. Bison's organization as 'Bison's drug'. This was probably supposed to be 'drug ring', as the word 'ring' was added in later versions of the game. In the Japanese versions, she calls it 'the organization of evil'; there is no mention of drugs. * Dhalsim's ending : In the Japanese versions, Dhalsim says that the photograph is of him a long time ago. In the non-Japanese versions, he says it is him 'in his past life'. Since only three years had passed, he obviously didn't actually mean that he had died and been reincarnated since the photograph had been taken. * Guile's ending : In the non-Japanese versions, Guile asks M. Bison if he remembers : him (Guile), him and Charlie and Cambodia. Bison says he remembers and that Guile was not the runt he was then. None of this is said in the Japanese versions. In the non-Japanese versions, after his wife Jane stops Guile from killing Bison, she says that killing him won't bring Charlie back, only make Guile a murderer, just like Bison. In the Japanese versions, 'Julia' only says that killing 'Vega' won't bring 'Nash' back. She does not say that it would make Guile a murderer. * Characters stats : If you enter the classic Konami code UP(x2), DOWN(x2), LEFT, RIGHT, LEFT, RIGHT, MP, LP on the Player-2 side during the demo fight in attract mode, it makes a bunch of zeros appear. 0001 = No idea, probably some sort of 'experience points' for 1P side. 0002 = The no. of coins put in in the left-hand slot. 0003 = Same as 0001, but for 2nd player. 0004 = Same as 0002, but for right-hand slot. 0005 = No. of times Ryu has been used. 0006 = No. of times Honda has been used. 0008 = No. of times Guile has been used. 0009 = No. of times Ken has been used. 0010 = No. of times Chun Li has been used. 0011 = No. of times Zangief has been used. 0012 = No. of times Dhalsim has been used. * Special Ending : Finish the game on 1 credit to see an additional credit sequence. * To get Ryu vs. Ryu : Start a fresh game on the left side (1P). Select any character other than Ryu. Play the game until you reach Ryu. Lose. Join in the game on the other side and hit 2P BEFORE the timer runs out. Select Ryu and enjoy fighting Ryu. * Guile Freeze Himself (aka 'Pose' and 'Statue') : Get close enough to your opponent to do an upside down kick. Charge back on the joystick. After charging back, press roundhouse to execute the upside down kick, while continuing to charge back. As soon as Guile kicks and starts to flip around to land on the ground, throw a Sonic Boom with fierce (this is why we have been charging back). Guile will freeze standing up on one leg (which is one of the frames of Guile's landing after the upside down kick). Un-freeze : You can 'un-freeze' at any time, even after the round ends (that makes it a good pause). To do so, execute a Flash Kick (charge down for 2 seconds then press up and any kick). * Guile's Handcuffs (aka 'Freeze the Enemy') : Though its not required, its easiest to do this move when the enemy is dizzy. Charge down for 2 seconds. Then press UP (as if you were doing a Flash Kick) and hit the Strong and Forward buttons, while trying to hit strong a split second before hitting forward. Basically what you are doing is throwing your opponent with strong, and while in middle of the throw, you do a Flash Kick. When this move is done, you see all of the frames of Guile's Strong throw, however instead of flying across the screen at the end of the throw, the enemy sticks to you. Un-handcuff : The 'un-handcuff' is the difficult part because it requires doing Guile's Shadow Throw. Charge back for 3 seconds then hit forward on the joystick along with the Fierce and Roundhouse buttons. Just like in the Handcuffs, you should try to hit the Roundhouse button slightly before the Fierce button. Also, you should hit the buttons slightly after moving the joystick forward. You can practice this by throwing Sonic Booms and seeing how far forward you can walk and still throw the sonic boom. 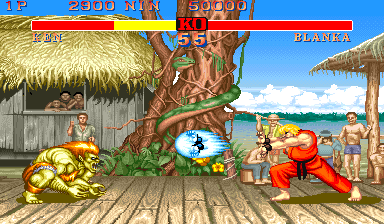 * Guile Invisible Throw (aka 'Shadow Throw', 'Magic Throw', 'Phantom Throw') : Charge back then hit forward on the joystick along with the Fierce and Roundhouse buttons. Just like in the Handcuffs, you should try to hit the Roundhouse button slightly before the Fierce button. Also, you should hit the buttons slightly after moving the joystick forward. You can practice this by throwing sonic booms and seeing how far forward you can walk and still throw the sonic boom. * Guile Reset the Machine (aka 'Blackout') : Do a throw with Strong. Then do a Flash Kick before the opponent hits the ground. You can also try doing this by doing a Flash Kick with Fierce and Roundhouse. * Dhalsim Invisible glitch : Throw a Yoga Fire (down, down-forward, forward) with both the Fierce and Forward buttons. This only works on versions 3 and 4 of the SFII boards. * Blanka Double Roll Bite (Blanka rolls slow, then fast then bites without landing) : Do a slow roll (with Jab). While rolling, charge for a second roll. Roll with Fierce before Blanka lands. While in the second roll, push the joystick forward and hit Fierce to bite. * Ken or Ryu Get Stuck on the car and bounce : Start the car bonus round. Break the left (or right) side of the car until it blocks. Face away from the car. Do a jump toward the car. Kick right after you jump but not at the same time as you jump. If you are lucky, you will be facing backwards. This is a tough one, so have patience. * Ken or Ryu Endless Hurricane Kick : Do a normal Hurricane kick then tap Roundhouse extremely fast (fast enough to do Honda's Hundred Hand Slap, Chun Li's Lightning Leg, or Blanka's Electricity) while Ken or Ryu is in the air. * Zangief Turbo Short : This is another glitch that is fun only to do once. If you hit your opponent with low Short, do another low Short, then hit Jab as fast as possible. If a 3rd low Short would have hit the opponent a Short will come out even though you are hitting Jab. If the short would have missed, Jab usually comes out even though short will from time to time. Programmers: Shin, Marina, Macchan, Ecchro!! [US] Apple iPhone/iPod (Nov.4, 2010) "Capcom Arcade [Model 397347348]"
[US] Apple iPhone/iPod (Sep.15, 2011) "Street Fighter II Collection [Model 459660048]"